The Fortified Churches Foundation is proud to present the new pocket-sized booklet titled „Churches and Fortifications in Transylvania“. It was published in the first weeks of 2017 and can now be obtained in three languages. It will formally be presented to a wider audience at the International Tourism Fair in Berlin (ITB) in March. 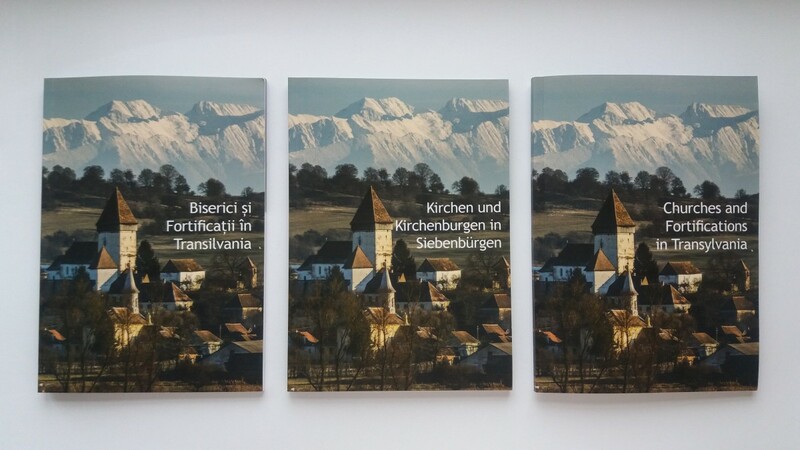 Each page boasts one historic monument (a total of 103) with pictures and short informative texts on the buildings – the larger cities of Sibiu, Brașov, Mediaș and Sighișoara are represented on two pages. The pictures were partly taken from the archives of the Fortified Churches Foundation but mainly contributed by Stefan Bichler. The booklet is available in Romanian, German and English and is funded by the Bavarian State Ministry of Employment and Social Affairs, Family and Integration. It can be obtained in the office of the Fortified Churches Foundation in Sibiu as well as at the many events taking place in 2017. It is free of charge yet donations for the work of the Foundation are always welcome.